A pretty cool, gritty crime thriller that starts off slow, but gets a lot better as it goes on. Ryan Gosling has been having a hell of a year. Really, he’s been having a hell of three months. August, September, and October of 2011 and he’s got three movies out, all completely different from each other, and all pretty good. One is a romantic comedy with Steve Carrel, crazy, stupid, love. The next is a George Clooney political corruption thriller, the ides of March. And now he’s also got the 80s-like, lone criminal movie drive. It’s a film that is meant to have that B movie feel, about a guy who drives around by himself at night. The super cool nightrider in the leather jacket. But this movie only wants to look like a cliché. In actuality, it wants to be something much more. Its plot line is full of fresh creativity, at least more than the usual film has. Drive tells the story of a stunt car driver who moonlights as a getaway driver and finds himself getting in over his head. The character is just named driver, and the movie has gotten comparison to other loner films, such as the French movie Le Samurai or Clint Eastwood’s Man With No Name trilogy. These comparisons are too abstract, when the obvious movie that this one should be compared to is sitting right there in the open. It’s the Ryan O’Neal seventies movie, the driver. This movie has that one beat by about a thousand times, but both movies are about getaway drivers who remain nameless and keep to themselves. 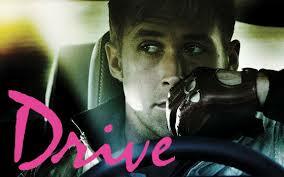 Drive starts off slow, really slow, and that’s the biggest problem of the movie. The first half hour or so barely seems to move. It’s all setup, of course, introducing us to the characters and the world. There’s an opening night time getaway scene where we get to see exactly how driver operates, giving the crew exactly five minutes inside, with him waiting on the road, behind the wheel. The scene shows him listen to the police radio, outrun a police car that is onto him, and then drive the crew into a clever getaway garage location for escape. After that opening, we get to see driver at his day job. We meet his friend and boss, Shannon, the head mechanic, played by Bryan Cranston. Shannon runs his own garage and has friends who are connected to the mob, such as Bernie Rose (a fantastically scary Albert Brooks). Shannon used to be a stunt driver for the movies and rose used to be a producer. Now Shannon just runs the garage, and his protégé, Driver (Gosling) does the stunt driving. Driver also meets a nice girl, named Irene, (played by Carey Mulligan) who lives next door to him in the apartment building and has a young son. He starts hanging out with them in that first half hour of the film, and again, it’s all just setup. The final piece of the introductions is that Bernie rose has a partner, named Niño (Ron Perlman) who is the real mob guy. He’s the local head honcho and the muscle man that gets things done. Niño has his own pizzeria named after him which serves as his base of operations, and we don’t know why we are meeting him or what he will have to do with the plot, but we can be sure that all of these pieces will come together later on. And they do. The real plot of the movie begins when Irene’s ex, named standard, is released from prison and owes money to some people who want to collect. Standard is beat up and found by driver and he explains to him that when he was in prison he had to promise money to people in order to get protection. But now that he’s out, every day he doesn’t pay up, the amount just doubles. That’s because these people he owes don’t really want him to pay. They want him to do jobs for them. He’s trying to go straight, but with this situation of owing money, he’s not being given much of a chance. So driver and standard go to see the guy who has a job for them to pull off and that guy tells them that a girl is coming with them. It’s the fiery red head from mad men, Christina Hendricks, hot as ever. And the three of them prepare for the job, with driver behind the wheel of the getaway car, Hendricks as the lookout, and standard being the guy who’s going in to get the loot. The job turns out to be a trap and a setup and from that point on the movie becomes about looking over your shoulder. The people behind the job end up being some criminal bosses very high up on the ladder and now they start sending people after driver and his friends. The movie launches into a whole new stratosphere, miles away from where it began. There is great, brutal violence, but more importantly there is real tension and edge of your seat suspense. There are moments that could have been better in this movie, especially the way the final bad guy is handled, but still it is quite a well-made and exciting film. It is covered in atmosphere and aesthetics, and Gosling does a really nice job playing the subdued tough guy. At a time when he’s got three movies out and is clearly ready to become the next super a list mega star, headlining his own action films if he wants them, this movie might be the first one that really shows off what he can do. Holding his own against George Clooney in ides of March was no small accomplishment, but like crazy, stupid, love, that movie was an ensemble piece. With driver, Gosling has a movie all to himself. And it really delivers. Clearly this is an actor who makes smart career choices and surrounds himself with movies that feature stellar casts in extraordinary roles. In this movie, Albert brooks, brain Cranston, and even run Perlman are all playing to their strengths. And Gosling is just having fun leading the pack.